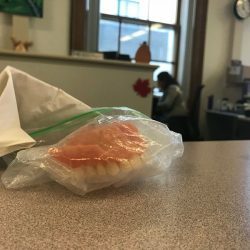 The Portland City Clerk is seeking the owner of a set of dentures left in a polling booth Tuesday. Perhaps it was something jaw-dropping on the ballot that caused it. A $64 million bond to renovate four elementary schools? A 16-page ordinance on rent control? Or a state proposal to expand Medicaid to as many as 70,000 low-income people? Regardless of the cause, the result was this: Someone left behind a pair of dentures in a Portland voting booth on Tuesday. The false teeth were discovered by an election clerk at Merill Auditorium. The choppers are now in a plastic bag in the City Clerk’s office at City Hall waiting to be reunited with the owner of the appliance. So, if you or someone you know voted there on Tuesday and are looking for a set of dentures – or if you recognize this smile – please call the City Clerk’s office at 874-8610.